It's been said that information is power. This simple cliché underscores the market control and business success that information yields. How satisfied are customers with your product and service offering? How will customers react to a decision to change a price or product? What are service representatives hearing from customers? What responses to competition will bring you success in a given market? 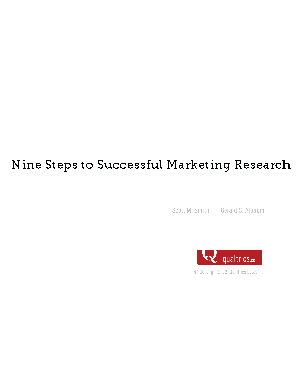 Simply put, the solution to most business problems can be found through marketing research. Increased Internet access in the last 15 years has made research available at a much lower cost and, therefore, more accessible to organizations of all sizes. As a result, the research field has exploded with new opportunities and methodologies, and organizations have more information at their disposal than ever before. At Qualtrics, we see all types of researchers: from students starting their first studies to elite researchers who have been conducting studies since before Internet surveys were even possible. The goal of this text is to help researchers improve their understanding of research so they can improve future studies. After all, information is power.